Moto G -- Best value Smartphone? 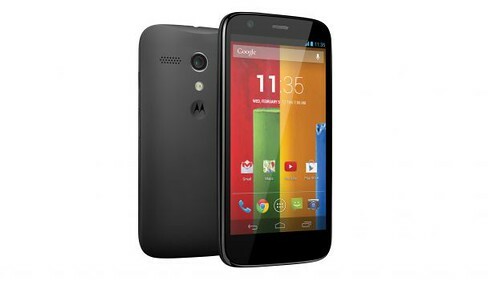 This month I purchased a Moto G 16GB Android Smartphone. I was impressed by the specification for the price. I got a SIM-free version from Expansys for €220 including a nice PDair leather flip cover/case. I have been using it for around a week now, with a Pay-as-you-Go SIM from Three Ireland that gives me unlimited data when topped up by €20, and it's a great wee device. Okay, the downsides are that it does not have 4G or an external SDCard slot, and the camera is just okay at 5MP, but it is super responsive, and bang up to date with the latest Android from Google. Now, I know I'm not a normal smartphone user, I have a Galaxy S4 as my main work phone and an iPhone 4S as my main personal phone, and this is a 3rd phone! Why? Well in the past year there have been three occasions when travelling when I would have bought a local SIM (mainly for data, but potentially for some calls) but couldn't do so easily because my main devices are still in contract and locked to an Irish operator. But this device is so good I'd have no problem recommending it to someone who wanted an Android device but was put off by the price of a Samsung Galaxy S4 or S5. So, give it a go, you might just like it.